The Mississippi River continues to rise in Louisiana’s capital city. Today’s levels are just above 43 feet. As you can see from the photo to the left, or Department of Public Works is being proactive in preparation for high waters. Low spots in the levee have been sandbagged and two miles of Tiger Dam is being laid to add another 2 to 3 feet of protection from overlap to the existing levee system. We attended a meeting of Mississippi River Stakeholders this morning at the Hilton Capitol Center in downtown Baton Rouge. While we all know that we are in a wait-and-see situation, we did learn a few things at today’s meeting that was hosted by the Mayor’s Office of Homeland Security and Emergency Preparedness (MOHSEP). We were impressed to learn that Baton Rouge’s MOHSEP is one of only two such agencies in the country with a #1 rating — this is a good thing. And our Mayor-President was just awarded the Lifetime Achievement Award by the Emergency Preparedness Association. The Mayor, MOHSEP and Department of Public Works are working around the clock to ensure that water stays out of the city. Our Mayor-President, Melvin L. “Kip” Holden addressed a standing room only crowd – advising them to “be prepared and not be complacent.” While no major flooding is expected there is always the X-Factor of a levee breach that the MOHSEP are proactively preparing for. Mayor Holden urged those in attendance to 1) Prepare as you would for a hurricane. Make sure to have bottled water, canned goods and that you have two weeks supply of prescription medications on hand; 2) Talk to your friends and neighbors, especially those who are elderly or may require assistance to make sure their needs are met; and 3) Have faith and pray. While we do not expect to see any major flooding in Baton Rouge, it will not be unusual to see some seepage in low lying areas and at the base of the levees as the river rises. Bryan Harmon with DPW explained that we will definitely exceed the flood impact from 2008. He said that if your property took on water in that event, you should expect water with this one — and to prepare. The most emphasized message of the day was that this is a historic event. When the river crests on May 22, it is expected to be at 47.5 feet – higher than the floods of 1927. The big difference is that there is now a levee system in place to protect the city. As we mentioned above, precautionary measures are being taken to further protect the levee and the city. Effective immediately, there is no parking or motorized vehicles allowed on the west side of the levee. 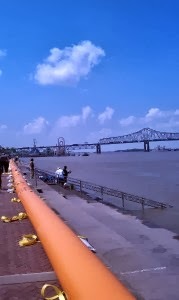 Reports indicate that effective Sunday, May 15 – Deep Draft vessels will not be allowed up the Mississippi. Low spots in the levee have been reinforced with sandbags and Tiger Dams are being laid, as well. Jim Ferguson with DPW urged the public to stay away from the Tiger Dam and DO NOT touch it. Cameras have been placed on the levees to monitor the river and Tiger Dams. For up to date information from the City of Baton Rouge and Parish of East Baton Rouge, log onto www.redstickready.com. Or follow them on http://twitter.com/redstickready and become a fan on facebook.